LITHUANIA. 1925. Reg. 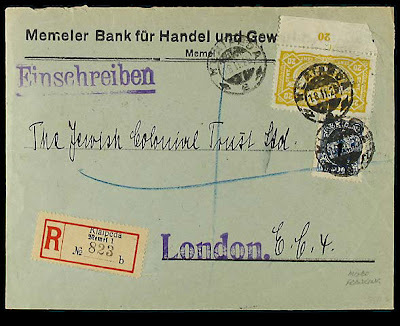 letter addressed to JEWISH COLONIAL TRUST, Ltd., LONDON with mixed LITHUANIA 20 c. air mail stamp (Sc C32) and MEMEL 1 Lit./1000 m. (Sc N80) franking. The stamps are tied by KLAIPEDA 18.II.25 literal ´a´ cancels. KLAIPEDA registry label, LONDON receiver on the back.